U.S. National Christmas Seal Stamp Album Pages, twenty (20) blank pages with title and border. All that is required is the addition of seals, and an album cover. Matches the U.S. National Christmas Seal Album, Basic and Advanced editions. 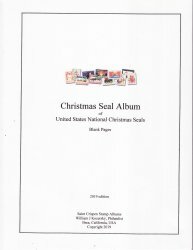 Blank U.S. National Christmas Seal Stamp Album Pages, package of twenty (20) pages. Blank pages with title and border. All that is required is the addition of seals, and an album cover. Design your own placement of your seals. Matches the U.S. National Christmas Seal Album, Basic and Advanced editions. Printed on 80 lb. acid-free, ivory, white, or light gray cover stock. Printed on one side with square corners. Standard 81/2x11 inch 3 ring punched. Saint Crispen Stamp Albums are published by William J Kozersky, Philatelist.